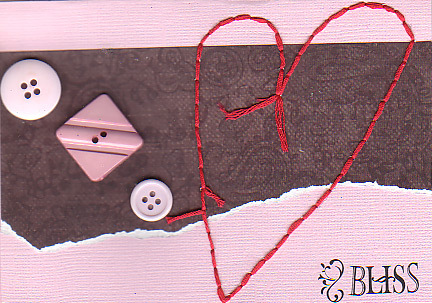 This was made for the feb cc challenge using scraps from the feb pack. Using a card with the remains - DUH! What a brilliant idea I love this and your hand stitching is great!!! Love it. love how you've left the ends of the threads free and the square button. I love that shabby heart, Jode! What a great effect, love the heart.